A full dossier, including many letters and official documents, has been given to the SRA (Service Régional de l’Archéologie de Toulouse) as a result of the inventory carried out in 1995. Following the archeological excavations carried out in 1865 by Jean-Baptiste Cessac, then by two officers, Colonel Stoffel and Captain Reffye, with a platoon of army engineers from Versailles, Napoleon III decided to buy the land at Loulié where the excavations had taken place. His Majesty the French Emperor made the purchase in order to ensure that the excavations at Uxellodunum/Puy-d'Issolud would continue, as well as to encourage any initiatives aimed at perpetuating the glorious history of the oppidum. Napoleon III gave power of attorney for the purchase of the land to Etienne Castagné, surveyor for the district of Cahors. The sale was effected by notarial deed dated 9 February 1868 and 1 March 1868 and registered in Cahors on 3 March 1868. The deed relates to a parcel of land of about 40 ares(*) belonging to Martin Gaillard, a farmer of Saint Denys, sole inheritor of Pierre Coste(1) who died at Saint Denys (in accordance with the will enacted by Lamothe in Saint-Sozy on 20 July 1866). The price paid by Napoleon was 3,000 francs. An extract of the deed of sale of 1 March 1868 states : "... The plot has the shape of a quadrilateral, it includes within its scope the famous fountain of Loulié, it is no longer part of the legacy of M. Gaillard, shown in the cadastral plan of the municipality of Saint-Denis as plot no. 236 and plot no. 237, section B, and is bounded to the north by the ravine which descends from the upper plateau that separates the property from that of Jean Laborie, on the east by the public road overlooking the rocks of the escarpment, on the west by a line substantially forming a right angle with the ravine, at the meeting point of the rivers and the channel coming from the fountain, and on the south by another line which connects the last two sides, and fixed to cover completely all the excavations carried out to date, and to give the area stated, as has been defined by boundary markers placed by M. Gaillard and M. Castagné, surveyor, residing in Cahors, sent to the site to that effect by the Prefect of Lot. ... ". Figure n° 1 - Plan de 1868, achat du terrain de Loulié par Napoléon III.
" To avoid any difficulties concerning the recognition and delineation of the said parcel, M. Castagné has filed a site plan indicating in red ink the part sold. The plan, which he has drawn up on a sheet of paper legally stamped, as required by law, and marked ne varietur(2), with the signature of M. Gaillard (Figure 1), will be registered before or at the same time as the present documents, and will remain as an Annexe after having been approved by the Prefect of Lot and M. Castagné. From this date His Majesty the Emperor will take possession of the said parcel, with full ownership and use of it..." . Napoleon III died on 9 January 1873, and the division of his estate is recorded on 1 June 1876. Under the terms of the marriage contract and the inheritance laws, the Crown Prince Eugene Napoleon inherited half of the land, the other half remaining the property of Napoleon's wife, the Empress Eugénie. On the death of the prince, who was killed by the Zulus during a patrol in the Bush on 1 June 1879, the Empress Eugénie inherited the land in question from her son's estate, as registered on 11 February 1880. From that date it was the Empress Eugénie de Montijo(3) who owned the Emperor's land. She died 40 years later in 1920 at the age of 94 years. No declaration of succession has been found dating from that time. From 1920, the land thus belongs to the heirs of the Empress. After her death requests were made to her heirs to yield the plots in question to the Martel tourist office. These letters appear to have received no response. 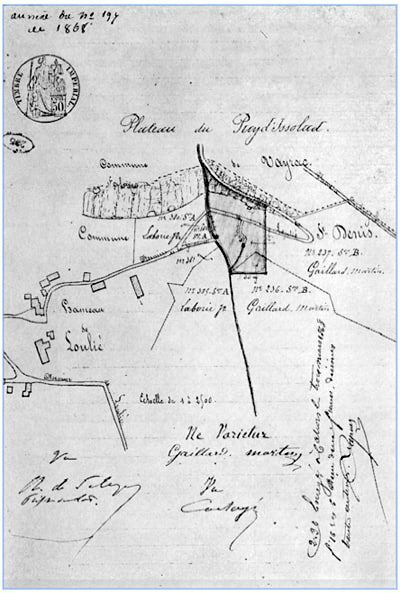 On 8 April 1923 at 9 am, a decision of the council of Saint-Denis lès-Martel requests that the site of Napoleon's excavations be classified as an historical monument, that is to say, plot no. 236 (11a 90 ac) and plot no. 237 (28a 10ca), on Section B of the cadastral map of Saint-Denis. The council's proposal was not taken up. Returning to 1869, Napoleon III had appointed Jean Taule, a former soldier, as guardian of the excavations at Loulié. He was a tenant farmer for M. Géraud on Puy d'Issolud. Jean Taule died on 1 November 1922. He gave no problems at all and provided facilities for Antoine Cazes (4) and Antoine-Laurent Bruzy (5) to carry out their research plus vital deforestation of the site. The Emperor had purchased the land for historical purposes, not for cultivation. Jean Taule and his wife Madeleine had two children: a son, Léon, and a daughter, Antoinette, who married a Tronche. A son, Joseph Tronche, was born from this marriage. After the death of her husband, Madeleine Taule and her children claimed ownership of the Emperor's land and they demanded a rent from Antoine Laurent-Bruzy for the garden and vineyard which they could no longer use(6). In 1930, relations between Laurent-Bruzy and the Taule family were increasingly strained(7), for example in 1935 Laurent-Bruzy threatened to take Leon Taule to court. In 1935, Laurent-Bruzy compiled a series of statements by the inhabitants of Puy d'Issolud, Vayrac and Saint-Denis, with the help of the priests and mayors of the area, indicating that Jean Taule was simply the guardian of the Emperor's land and that he had no property rights over it. In addition, as the unmaintained portion of the land brought in no returns, as evidenced by the tax records, Laurent-Bruzy also contacted several notaries, lawyers, the family of the Prince Murat, heir to the land of the Emperor, and many others, with a view to buying the land. His premature death on 25 March 1943 put a stop to the proceedings and the land at Loulié became a wasteland, prey to clandestine excavations. In 1825, the old cadastral plan held in the mairie of Saint-Denis-lès-Martel placed the feature known as the fountain of Cessac on plot no. 237, Section B, and the Roman tunnel on plot no. 236, Section B, the two plots belonging to Martin Gaillard Coste. From 1869, the land was shown on Sheet 301 of the cadastral records under the name of the French Emperor Napoleon III. From 1882, the name of Napoleon III was deleted and replaced by Napoleon and the Empress Eugénie de Montijo. From 1903, the name of the Empress was deleted and replaced by the name of Jean Taule, tenant farmer of M. Geraud of Puy d'Issolud. Since 1869, the tax collector in Martel had sent tax notices directly to Jean Taule. Curiously, in 1936, the name in the register of contributions in Martel is Jules Taule instead of Jean. But Jules Taule had died a long time before and in any case was not a member of the same family as Jean Taule. In 1963, during the revision of the cadastral plan of the commune, the Emperor's land became a triangle (Figure 2), shown in section AH as plot 171 (14 to 45 ca) and plot 173 (16 to 35 ca), a total area 30a 90 ca. The remaining land, about 10 ares, was allocated for an unknown reason to plots 172 and 235 belonging to the Lespinard family who, at that time, had a water pipe installed from their hamlet of La Coste to the basin built by Jean Burello (Lespinard family) et Albert Aussel(8). This pipe crossed the Emperor's land. In 1994, we gave the full dossier on the history of Napoleon's land to M. Roger Perrier (9), notary of Vayrac, asking him to find a solution which would give the owner of the land the authorisation to carry out new archeological excavations. For this he called upon five senior citizens who testified that since their youth, that is, for more than fifty years, they had never known or seen anyone use these plots, neither had they heard or known of anyone claiming the property. In addition, M. Sérager, mayor of the municipality of Saint-Denis-lès-Martel from 1977 to 1995, stated that the said parcels were exempt from property tax. This legal document was passed to Saint-Denis-lès-Martel on 12 April 1995 where all the parties signed with M. Perrier, who paid the registration fees of 500 francs. From that date, the land originally purchased by Napoleon III fell into the public domain. 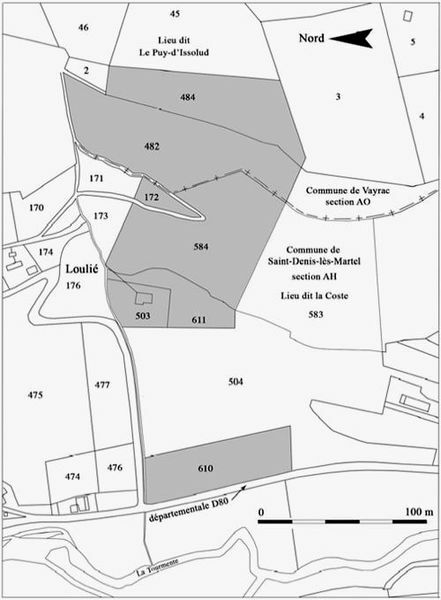 Figure n° 2 - Cadastre actuel de Saint-Denis-lès-Martel et Vayrac. En gris, les parcelles acquises par le S.M.G.S.U. en 2010. In 1998, Jean-Pierre Combret, mayor of Saint-Denis-lès-Martel, under a resolution of the council dated 28 May 1998, decided to acquire plots 171 and 173 of section AH(10) on behalf of the commune. The deliberation of the council was registered at the prefecture of Gourdon on 8 June 1998. Following a prefectural decree (Vol. 1998 no. 2068) dated 11 February 1998 from the prefect of Lot, published on 5 March 1998, the state took possession of the vacant property, under no. 460/01340 (the two parcels in question). This property thus belonged to the state by prefectural decree within the meaning of Article L25 of the Code du Domaine de l'Etat. Previously, it belonged to M. Jean Taule, who had died well before the revision of the cadastre in 1966. The legal document was approved in Cahors on 27 July 1998 and the land was purchased by the commune of Saint-Denis-lès-Martel for 3000 francs. The curator in Cahors recorded the deed on 11 August 1998 under no. 6489. In the municipality of Saint-Denis-les-Martel (in section AH) at a place called "La Coste" : five parcels referenced on the cadastral plan as plot nos. 172 (805 m2), 503 (2000 m2), 584 (10 683 m2), 611 (2221 m2) and 610 (6067 m2). In the commune of Vayrac ( in section AO) at a place called "Issolud" : two parcels referenced as plot nos. 482 (9959 m2) and 484 (7397 m2). Finally, these plots of land were classified on the list of historic monuments on 29th November 2010. (*) The are is a unit of area, equal to 100 square metres (10 m x 10 m), used for measuring land area. It was defined by older forms of the metric system, but is not included in the modern SI system. From 25 February 1943 : Paul Antoine Lespinard married to Marie Rebière. Since then the property has remained in the family Lespinard. (2) Varietur : that which cannot be changed (for a legal act). (3) Maria Eugénia Ignacia Augustina Palafox de Guzmán Portocarrero y Kirkpatrick of Closeburn, Marchioness of Ardales, Marchioness of Moya, Countess of Teba, Countess of Montijo (Born : Granada, 5 May 1826, Died : Madrid, 11 July 1920) known as Eugénie de Montijo, was the wife of Napoleon III, French Emperor, and thus Empress of France from 30 January 1853 to 11 January 1871. (4) From 1913 to 1920, Antoine Cazes, a teacher at Martel, conducted excavations with friends and students in the area of the fountain of Loulié and on the plateau of Puy d'Issolud. (5) Antoine Laurent-Bruzy, originally from Roussillon, established as a dental technician in Brive-la-Gaillarde, was fascinated by the question of Uxellodunum. Above all a poet, he collected a large number of legends concerning Puy d'Issolud and wrote several books. From 1920 to 1941, with a large team, he carried out very extensive excavations around the fountain of Loulié. In 1921, Laurent-Bruzy employed thirty workers for 1-2 days per week. In 1932, he only worked on Sundays, with 5-6 workers including children aged 10 to 15 who "drove" the wheelbarrow. From 1937, he carried out only two or three excavations. By 1939 he was employing only one person. (6) Citing the prescription trentenaire, whereby the possessor of property can, under certain conditions, become the legal owner of the property after holding it for over 30 years. (7) We found several very virulent letters on this matter addressed by the Taule family to Antoine Laurent-Bruzy. (8) Albert Aussel was a close friend of Laurent-Bruzy. He recruited workers for him, paying them and, on the occasions when Laurent-Bruzy was absent, he led the excavations at Loulié between 1920 and 1940. He was also responsible for sending certain objects to museums. (9) Roger Perrier helped to research the Taule family records. (10) This decision was made solely by the council of Saint-Denis-lès-Martel. (11) These land acquisitions were made solely at the discretion of the SMGSU.